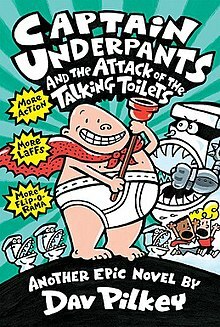 Captain Underpants and the Attack of the Talking Toilets is an American children's book (taking the form of a novel) by Dav Pilkey, and the second book in the Captain Underpants book series. It was published on February 1, 1999. It marks the first appearance of the Turbo Toilet 2000, the Talking Toilets, and the Incredible Robo-Plunger, as well as George and Harold's nerdy tattletale nemesis Melvin Sneedly. Horwitz Elementary School will hold its second annual Invention Convention. While George and Harold could themselves be Principals for the Day, Mr. Krupp thinks of putting them in study hall all day due to them, last year’s Invention Convention had to be called down by them because they glued everyone to their seats except they. While getting ready to secretly sabotage everyone's inventions after thinking this isn't fair, the two boys run into Melvin Sneedly, working late on his invention, the PATSY 2000, a photocopier that can turn a simple two-dimensional image real. He demonstrates by putting in a photo of a mouse; out comes a real one. George and Harold assume Melvin put the real mouse in earlier, but promises not to sabotage it, as long as he doesn't report them and eventually promises. Because of George and Harold's pranks, the convention soon has to be called off, and Melvin breaks George and Harold's promise and tattles on them after Mr. Krupp is left confused as he believes that he had thought he put George and Harold in study hall. An infuriated Mr. Krupp puts them on detention for the rest of the school year, threatening them with suspension if they leave their detention once for any reason. George and Harold get assigned writing lines for two hours after school. With each boy using a quick line-writing device, they write all their lines in three-and-a-half minutes, then make a new Captain Underpants comic: Captain Underpants and the attack of the Talking Toilets. They decide to go to the copy machine, but realize that Mr. Krupp will suspend them if they leave the room and they decide to sneak out without Mr. Krupp catching them. However, the copy machine is surrounded by teachers, so they copy off of Melvin's machine as they still believe it is a normal copy machine, but the talking toilets come to life. While fleeing, George and Harold are caught by Mr. Krupp who was walking in the hallway and are suspended. The boys try to explain what happened in the gym, but Mr. Krupp refuses to listen and doesn't care since George and Harold are suspended as he tells them to leave the school. All the teachers celebrate in the gym with Ms. Anthrope notifying George and Harold's parents to tell them the news, but Mr. Meaner, the gym teacher, is promptly eaten by one of the toilets. Ms. Ribble then snaps her fingers at a toilet, making Mr. Krupp turn into Captain Underpants. George and Harold chase him as he takes several pairs of underwear from unsuspecting clotheslines. Back at school, the trio finds only Ms. Ribble on the toilet table. The trio slings chipped beef with his underwear, and the toilets vomit all the teachers out and die. Soon after, the Turbo Toilet 2000 bursts out of the school and despite Captain Underpants's efforts, he swallows Captain Underpants whole. The boys sneak into Melvin's machine to make a super-powered robot called the Incredible Robo-Plunger, which plunges its plunger into the Turbo Toilet 2000's mouth, letting the boys save Mr. Krupp. He fears that he will be fired for the damages, but the Robo-Plunger repairs all of it, and flies off to Uranus with the command never to return. In return, Mr. Krupp cancels their detention and as the principals, the boys hold an all-day carnival for the students and put the teachers (and Melvin for his tattling) in detention. At the end of the day, Mr. Krupp questions how the carnival will be paid for; and the boys reveal they sold his antique furniture. Mr. Krupp gets furious, and Miss Anthrope snaps her fingers after the boys, making Mr. Krupp become Captain Underpants again. In another normal day at school, a UFO shoots rays at the school, which gives the toilets life to eat everyone at the school. Underpants appears and places plungers in the toilets' mouths, then the toilets' leader, the Turbo Toilet 2000, appears and Underpants gives it a wedgie on a stop sign, from where it's slung at the UFO, causing both to explode. George and Harold want everyone to know what happened in The Adventures of Captain Underpants. They make this comic book for everyone to know. The story involves 3 parts. A similar comic with added details appears in every subsequent sequel. George and Harold get introduced as two cool kids. It says that everyone loves their homemade Captain Underpants comics except for their principal, Mr. Krupp. It goes to when Mr. Krupp blackmails George and Harold, so they buy the 3D Hypno-Ring and hypnotize Mr. Krupp into Captain Underpants. He jumps out of the window and heads to an old warehouse but before he can get in it explodes and he runs away along with George and Harold who had been running after him the whole time. It shows them heading back to school when George pours water on Captain Underpants's head which turns him back to Mr. Krupp. George and Harold warn everyone not to snap their fingers around Mr. Krupp for then he will turn back into Captain Underpants. So now nobody snaps their fingers and there is piece throughout the whole entire village. George Beard: One of the students at Jerome Horwitz Elementary School. He is friends with Harold Hutchins. Harold Hutchins: In the same school as his friend, George Beard. Mr. Krupp: Jerome Horwitz Elementary School's grumpy principal whose goal is to get George and Harold into trouble and stop them from pranking him and the teachers. Captain Underpants: A superhero from George and Harold's comics, George and Harold accidentally hypnotize Mr. Krupp into thinking he's Captain Underpants. Melvin Sneedly: The school genius, tattletale and George and Harold’s nemesis. The Incredible Robo-Plunger: A robot who beats up the Turbo Toilet 2000. He is made by the PATSY 2000. Madison Mancini: A student who invented the Automatic Dog-Washer that was ruined by George and Harold. Donny Shoemyer: He invented the Electric Ping-Pong Ball Server which was also ruined by the pranking duo. Freddie Moore: A student who invented the Volcano Detector. Ms. Ribble: The teacher of Jerome Horwitz Elementary School and one of Mr Krupp's goons. Miss Anthrope: The school secretary and one of Mr Krupp's goons. Mr. Meaner: The gym teacher at Jerome Horwitz Elementary School and one of Mr Krupp's goons. The Talking Toilets and the Turbo Toilet 2000: The villains of the book. The Turbo Toilet 2000 returns on his own in the eleventh book, Captain Underpants and the Tyrannical Retaliation of the Turbo Toilet 2000. The Adventures of Captain Underpants, the first Captain Underpants novel that Dav Pilkey made in 1997. Captain Underpants and the Invasion of the Incredibly Naughty Cafeteria Ladies from Outer Space, the book that follows this one. Captain Underpants, the series Dav Pilkey made. This page was last edited on 23 April 2019, at 04:19 (UTC).